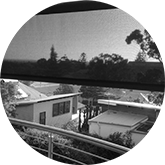 Based in Perth WA, we design, manufacture and install bespoke awnings, retractable roofs, outdoor blinds, outdoor umbrellas and shade sails for residential and commercial clients all over Australia including Sydney, Melbourne, Brisbane and Adelaide. 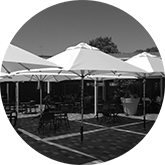 Awning Republic have grown to become Perth's most trusted commercial specialists in Awnings, Umbrella's, Retractable Roofs, Outdoor Blinds and Shade Sails, while our Retractable Awnings and Retractable Roofs remain highly popular with residential clients looking for superior design, workmanship and longevity. By only producing work of the highest standards and offering a great range of exclusive products designed specifically for the Australian market, we have have firmly established ourselves as leaders in our field. Trusted by companies all over Australia, including Shopping Centres, Hotels, Restaurants and Bars, our clients know that we will always push the boundaries to find individual tailor made solutions for their projects. 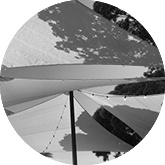 Dedicated Awning designers will work with you to come up with a concept that is best suited to your requirements. Whether that means utilising an existing product or developing a new one, we have the knowledge and capability to ensure you get the best result possible for your project. 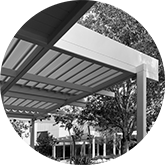 We can also provide detailed drawings and awning certification. Combining traditional fabrication methods with the latest and most up to date sewing and welding machines enable us to produce products of the highest quality. 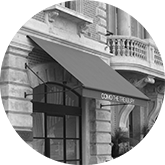 With a highly skilled group of awning and material fabricators we ensure all of our products are produced with the utmost care and attention to detail. Our installation teams have undergone rigorous in-house training and have extensive knowledge of all our products including our Perth made Awnings and our technically advanced Retractable Roofs. Your installer will be highly experienced so you can rest assured knowing that your project is being kept in safe and competent hands from start to finish. We are proud of our comprehensive after sales support service. Most of our products carry a full 5 year warranty and we are always on hand to provide advise on any aspect of our products from ensuring your fabric is looked after correctly to getting the most out of your motorised awning, blind or retractable roof. 1 Get in touch and have a brief discussion with one of our sales team so we can get a general understanding of your requirements and provide you with some options. Where possible we will also give some guidance on expected costs and lead-times. 2We will then arrange a convenient time for a free onsite consultation and provide you with a formal quotation. During the consultation we will show you fabric and colour samples and give you expert advise on products best suited to your needs. 3 Just let us know you would like to proceed with the quotation and we will confirm sizes, colours and time-frames. We will also provide detailed drawings for you to approve prior to manufacture, ensuring total client satisfaction.